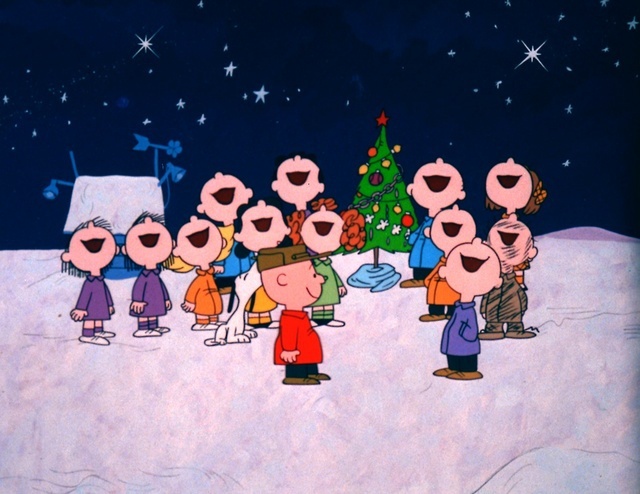 Where are Christmas Carol Events on the Gold Coast? We wish you a Merry Christmas and a Happy New Year". Tradition is something that becomes ingrained and forms a structure for the world we live in. Christmas traditions that came from cold Northern Climes manage to hang on in the sunny southern land of Australia. "…Oh bring us a figgy pudding and a cup of good cheer. We won't go until we get some, so bring some out here…"
Carol services are planned for all over the Gold Coast and take place on balmy, summer evenings instead of cold, winter nights. There's the Mayor's Christmas Carols on Saturday 8th December at Broadwater Parklands, Southport with special guest, pop star turned actress, Jessica Mauboy. The main entertainment starts at 6pm and finishes at 9pm with a spectacular fireworks display. The event features: Figaro, The 7 Sopranos, The Blenders, Lachlan Wallace, also introducing Liz Conde & The Triple Talent Dancers and includes a twilight Southport Yacht Club flotilla of illuminated boats. LED candles and Christmas items will be on sale for $2 with all proceeds going to the Salvation Army. For more info call: 5581 6877. 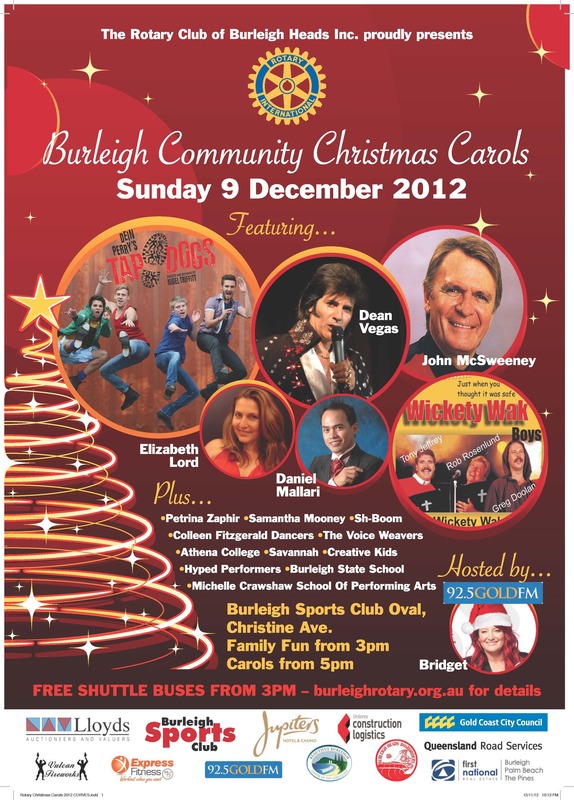 The Burleigh Community Christmas Carols, now in the 29th year, will be hosted in a new venue this year – the John Handley Oval at the Burleigh Sports Club on Christine Avenue, Burleigh Waters (note - not the Justins Park beachfront site as per previous years). From 3pm – 9pm there will be family fun, kids activities, market stalls, showbags and food on sale. The carols are from 5pm with Gold FM's "Bridge" as MC. There's fireworks at 8.30pm. Artists for the event include Tap Dogs, Dean Vegas, Wickety Wak Boys, Elizabeth Lord, John McSweeney, Daniel Mallari, Petrina Zaphir, Titanettes, Hyped Performers, Sha Boom, Athena College, Colleen Fitzgerald Dancers, Samantha Mooney, The Voice Weavers, Savannah, plus many more. Free shuttle buses will be running from the Lower Gold Coast Highway – Burleigh Heads State School, Treetops Shopping Centre, and Christine Corner from 3pm-5pm and return 8:30pm-9:30pm. Gold Coast choirs and roving performers will perform carols each night (during 13 - 22 December, with a final performance on Christmas Eve) at Surfers Paradise, with gala Cavill Mall Carols by Candlelight performances. There's Santa's mailbox (don't forget to post your Christmas letter) where Santa will set up shop along side his surfboat sleigh. The Loony Tunes Christmas Show will be in Cavill Mall. Dates and times are: Santa appearances in the Mall 6 - 9pm, Loony Tunes Christmas Stage Show 6.30 - 7pm, Loony Tunes Christmas Meet & Greet 7.30 - 7.45pm, Loony Tunes Christmas Stage Show 8 - 8.15pm. 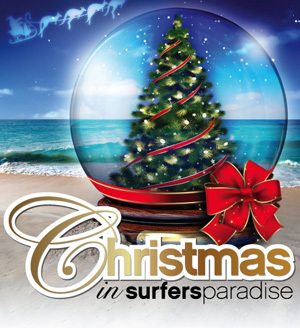 On Sunday the 23rd (6 - 9pm), Surfers introduces a magical new Carols on the Beach event on Surfers Paradise Beach (end of Hanlan Street). With stars from TV hits X Factor and Australia's Got Talent and fireworks to end the night too, Surfers looks like it has something for everyone in the family. For more info phone: 5584 3700 or click here. 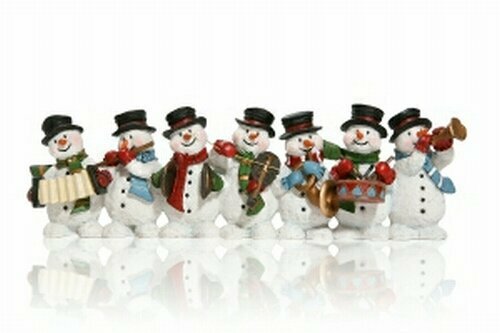 There are, of course, a host of Christmas Carols, Concerts and Christmas events, both big and small, all over the Gold Coast which can be found here. So pick an event, join in the spirit and spread some Christmas cheer. If you would like to list your event below this article, leave details with a contact for more info. 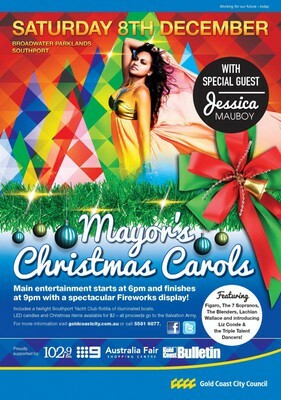 Another great family free evening out over Christmas is to visit the Gold Coast Christmas Lights. If you are looking for a special treat, check out the White Christmas at Movie World event. We went to the carols at Nerang last year. It was a great event with the kids. 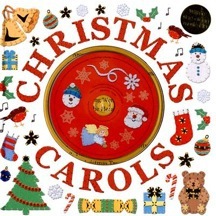 It was interesting to learn about the origin of Christmas carolling.